This will vary depending on the air quality in your home and other environmental factors – in more dusty or polluted environments you should clean your filters more regularly. As a general rule of thumb, you should clean domestic system filters 4 times a year minimum and commercial system filters one or two times a month. Regularly clean your filters (minimum 4x year). Clean with a hose/cold running water. Air dry out of direct sun. DO NOT use a brush or vacuum (because it can damage the filter fibres over time. We firmly believe that water is the best method). This will vary between different types of air conditioners and their usage. As a general guide for domestic systems, where the filters are being cleaned regularly, we recommend servicing once annually. Commercial systems will require more regular maintenance than a domestic unit. The annual frequency will depend on the level of usage and the environment the system is positioned in. Who do I speak to for after sales support / servicing? Total Kooling Solutions! We take pride in our high standard of customer service and are committed to providing ongoing, after sales service support to you, our customer. This includes, but is not limited to general maintenance servicing/ breakdowns and repairs/ DAIKIN Warranty repairs*. We are also here to offer experienced, professional advice to answer any queries you may have about your system. *We are authorised to carry out warranty repairs on Daikin systems only. For all other brands; contact the manufacturer directly, or the original supplier and they will advise you on their correct, authorised warranty procedures and contacts. How much does a maintenance service on my air con cost? Prices can vary, depending on the system type and the number of systems being serviced. 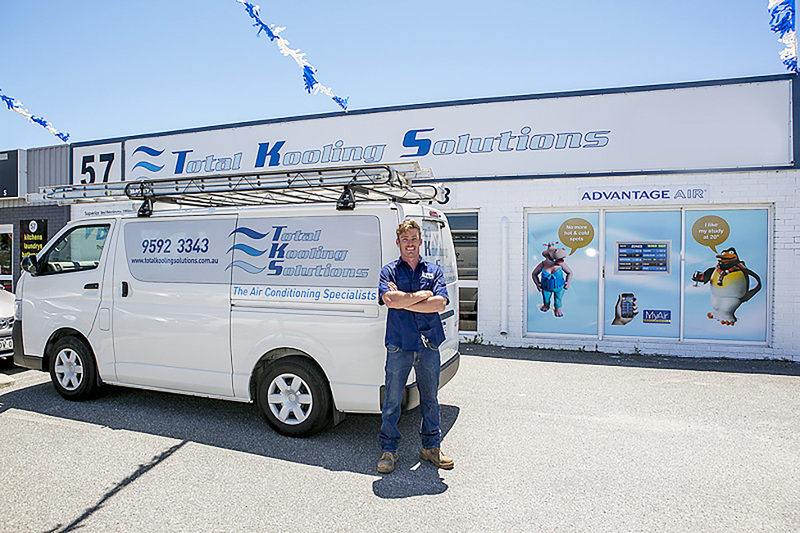 For a free quote and answers to any other queries you may have, please contact us here or call 9592 3343 today! What types of air conditioners do you service? Whole of Home Ducted / Wall Mounted Splits / Multi Splits / Ceiling Mounted Cassettes / Floor Mounted Splits (Refrigerated Reverse Cycle & Cooling Only) / Evaporative. For a free quote and answers to any other queries you may have, please contact us here or call 9592 3343 today! I've cleaned the air filter on my Daikin, but the warning symbol/light won't go off? Once you’ve cleaned your air filter, press reset to turn off the filter light. On wall mounted split systems and floor consoles, remove the grille to find the reset button. For ducted air conditioners, select ‘Reset Filter Indicator’ which is located in the main menu of your controller. My DAIKIN air conditioner won’t switch on and the operation lamp is flashing – what do I do? Your air conditioner may require technical assistance. Please contact the Daikin Specialist who installed it for you, if that was Total Kooling Solutions phone 9592 3343 for assistance. In the unlikely event that a fault develops with the air conditioner the microprocessor in the indoor and outdoor units will diagnose the fault (where possible) and a fault code will display on the controller screen (e.g. L1). If this occurs write down the fault code and then switch off the unit and contact your installer. This code will indicate to the installer/ repairer what the problem may be. Wait one minute until the microcomputer is prepared for operation. The outdoor unit is defrosting. HEAT operation starts after the frost on the outdoor unit has been removed. This can take about 4 to 12 minutes. Once the room/operating zones have reached your set temperature, the indoor unit switches to fan operation. A small amount of air will continue to circulate through the system in order to monitor and maintain the air temperature. This circulated air can feel cool, but it is at room temperature. Once the air drops in temperature at all, the system will cycle back on and resume heating. In HEAT mode; the frost on the outdoor unit melts into water or steam when the air conditioner is in defrosting operation. In COOL or DRY mode; moisture in the air condenses into water on the cool surface of the outdoor unit piping and drips.